UPDATE Jan 2019: This blog is now almost two years old and is closing in on a consistent 100,000 pageviews/month! It has had many, many, many viral posts, and now generates a solid, completely passive monthly income! All by following the steps in this post…nothing more! Yay for blogging! This blog was started not too long ago (less than five months ago) and I can’t believe how much it’s grown!! 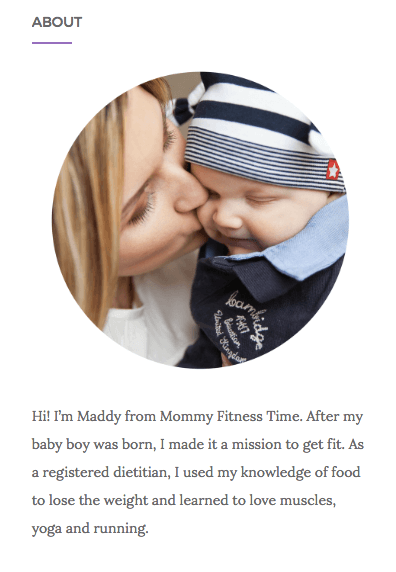 I also have met other mom bloggers in this niche and actually had 2 viral posts! Some of these links are affiliate links and I may earn a commission if you use one. I hope you find this post useful (I had tons of fun writing it) and thank you soooo much for your support! See, I’m not some super duper expert blogger, although I’ve had some success over the past year or two; I’m a stay-at-home mom who decided to start blogging (freelance writing at first, actually) when my twins turned one, and I was facing going back to work. I wanted to do something to be able to stay home, and working online seemed like the best choice. I needed that connection and fun by being a SAHM. And yeah, the monetization aspect of blogging is intriguing and let me tell you, it’s very real and life changing. But it all started with a brand new blog, many late nights, zero visitors, and absolutely NO idea what the heck I was doing. But back to blogging, how did this blog get two viral posts in less than five months of blogging (and two of those months or more there weren’t even any posts!)? If you’re thinking about starting a blog and want to get some quick traction, this post will help you start a blog, understand WordPress and teach you how to write viral content. Because the more pageviews and traffic you have to your new blog, the more opportunity you have for generating income, right? When Smart Mom Ideas first started out, things were a little slow going to say the least. Transitioning from a pure SAHM to a part-time blogger or WAHM can be quite a shock! From learning about blogging, to WordPress, to Canva, to social media and more, who has any time left to actually write blog posts?! Things started to get rolling in May and six posts actually got published! Wha, what?! There must have been some real mom mojo flowing that month. Before that, it was a post every month or two…on a good month. In May the blog grew from practically 0 visitors a day to 450 visitors to 1,200 and later up to 2,500 visitors….in one day! Like I had mentioned, posts were very infrequent before that and the blog wasn’t growing at all. But once a few posts got out there, along came traction…and a lot of it! The first semi-viral post was about how to live on one income so you can be a SAHM. It’s a list post of 63 ways and I guess it picked up on Pinterest and more and more (and more and more and more) people started coming to this measly two-month old blog! That first viral post grew traffic from 300 visitors a day to a whopping 1,200 visitors in a day. After that initial surprise, traffic decreased, but it didn’t decrease by much. For a few days after, the site was consistently getting 1,000 visitors a day. Then it trickled down to around 800 visitors a day. And then, this post came out. And that just took off like wildfire on Pinterest! I couldn’t believe it. In one day Pinterest brought 2,500 visitors! The biggest lesson I learned is that anyone can have a viral post. You don’t need to have blogged for ever and you don’t need an email list or be on social media all the time. The next lesson I learned is that you don’t have to be consistent or have a lot of content to have a viral post. You just need the right post. You can have more than one viral post. I wanted to see if I could generate another viral post, and I effectively did. This means this is a learned skill that anyone can do. Can Any Blog Niche Have a Viral Post? You bet! No matter the niche, it’s the type of post that will relate to your readers and get them hooked onto your blog. If you are brand new to blogging, though, it’s best to find some kind of blog topic, or niche, so that you know what you are going to write about. Smart Mom Ideas probably leans to more of a lifestyle site that talks about multiple topics like parenting, organizing, making/saving money and blogging. Determining your blog’s focus is important. The list in this post is a good start. But, how do you really figure out what you want to write about for years to come? Think about what you can’t stop talking about – is there some topic that all your friends know you can’t stop talking about? Maybe it’s essential oils or bullet journaling or baby led weaning. This can help you narrow your blog niche. See if there are blogs in that niche – this is important because it tells you if your niche is viable. 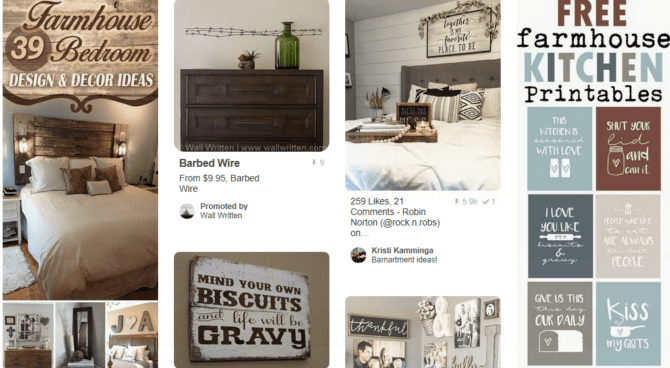 You can easily search on Pinterest your blog topic to see if there are pins. You can also search on BuzzSumo to figure out if your blog topic is popular (this will help you decide if you can monetize your niche too). Here is the result for farmhouse decor. This niche topic looks extremely popular on Pinterest. This tells me that if you wanted to start a home decor blog, start writing about farmhouse decor. See if people are struggling with that topic – you need an audience for your new blog so that you can generate traffic and income. The best way to do that is to find a blog niche that people need help with. Even if you have a lifestyle blog like me, you can have certain topics that will address pain points for your audience. After figuring out your niche, know the “why” behind starting a blog. For me, the biggest “why” to starting a blog was to have some kind of creative outlet as a SAHM. 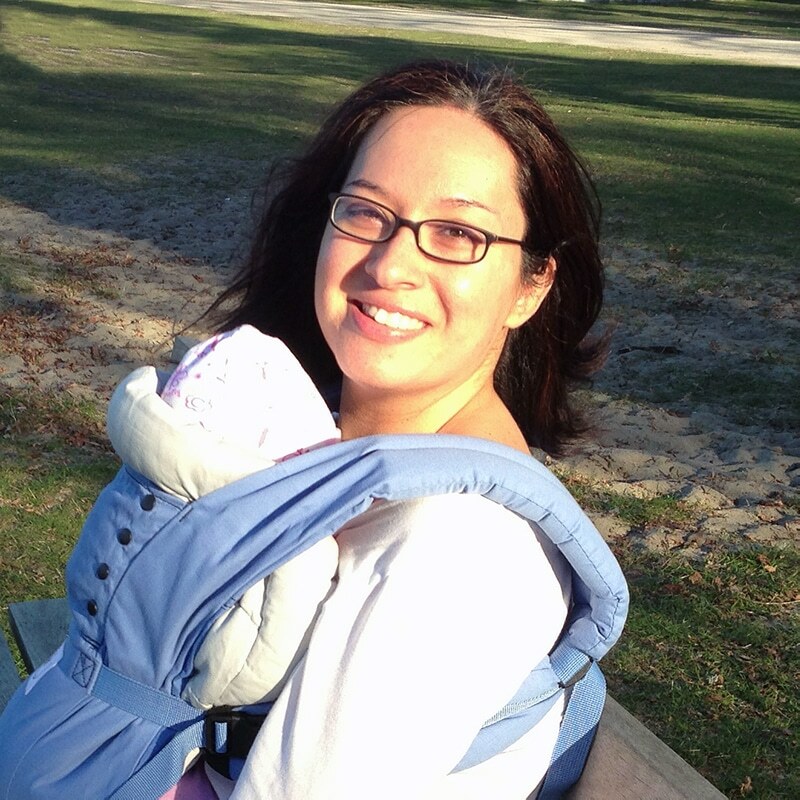 I was working as a freelance writer, and I wanted somewhere to relax, vent and also to meet other moms online. I didn’t want to drown in the day after day tasks. My other “why” was to see if I can generate a few dollars out of this whole blogging thing. I mean if other moms are doing it, why can’t I? Once you have a blog niche or decide to do a lifestyle blog, you need a name for your blog. The name you pick should represent your blog’s focus, but that doesn’t mean you can’t use your name or something else. Make sure the name is easy to pronounce and spell, and that it’s short. I suggest having a couple of spare blog names just in case. If you are struggling to figure out your blog name, why not use a generator? 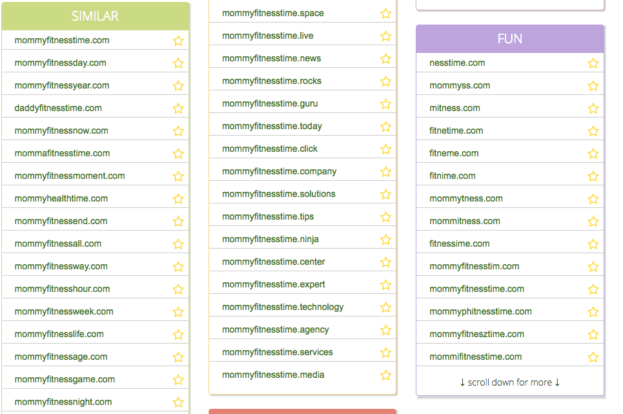 Name Mesh is a domain name generator and makes figuring out your blog name fun! There are several categories they use to come up with different blog names: common, fun, short, SEO, new, similar and mix. Here is the result for mommy fitness time. All of these end in a .com and for me, that’s the best domain for your blog! Are you excited about starting a blog? 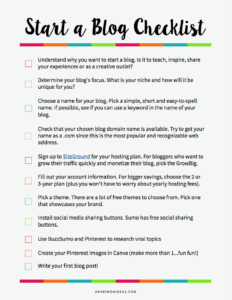 If you haven’t started a blog, but want to, here are the steps to get going with your blog. You also need a platform to have your blog on. The most popular is WordPress (.org). So, to have a self-hosted WordPress blog you need a reputable and supportive web host. Since getting into this whole blogging world, if there’s one pet peeve I have, it’s sloooowwww blogs. This girl doesn’t have time to spare. I lucked onto using SiteGround as my hosting provider and IMO they are the best when it comes to speedy sites. Why Choose SiteGround for Your New Blog? There are a couple of reasons why you should choose SiteGround. The first is that they have amazing 24- hour support. Whenever you have a question about your site, you can use their live chat anytime. If you don’t want to chat, you can phone them too. They are always available and you don’t have to wait hours to get help. And they don’t get mad when people ask silly questions…like I’ve done many times before. Sorry guys, mom brain! Their uptime is 99.99% incredible! It’s a fact that your blog can go down any time of the day. 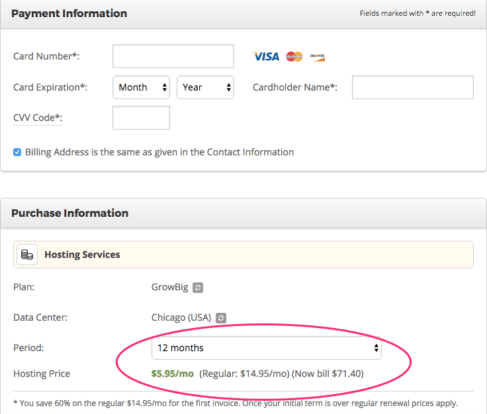 But, if you choose SiteGround as your hosting provider, you won’t have to worry about that. That means every time someone goes to your blog, ninety-nine (point nine nine) percent of the time it won’t be down. I’m not really up on all the lingo (or math), but I’m told that this is incredible. 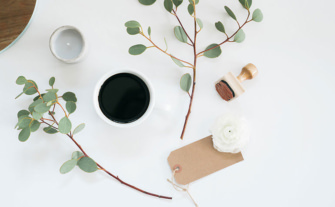 These two things alone can help you get your blog up and running so that you can start getting more pageviews, and you can be confident all those future viral posts are in good hands. 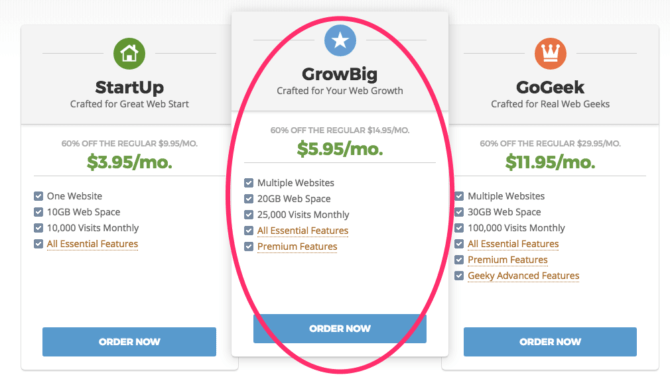 But, if you want to supercharge your blog, SiteGround has the SuperCacher on the GrowBig plan. Having this can handle those viral posts with ease and won’t slow down your site. 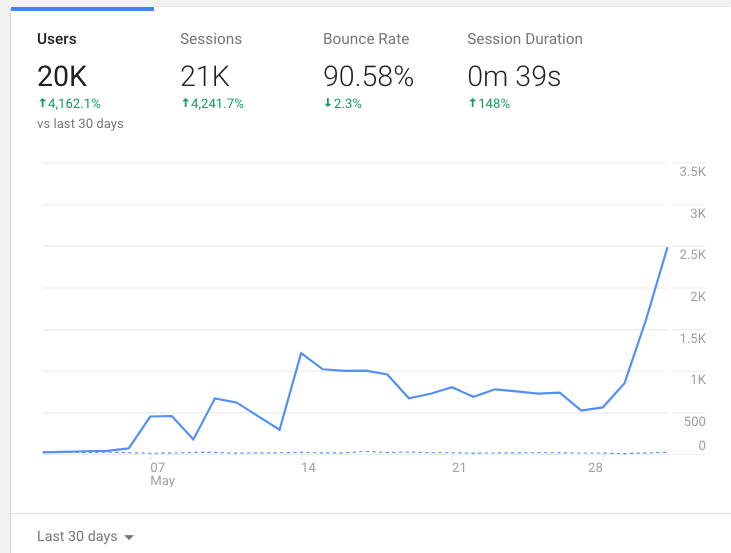 So when thousands of people show up to your blog in under one hour (don’t we wish), your site won’t even skip a beat…all because of SiteGround’s SuperCacher. There are three plans you can choose from as a new blogger: the StartUp, the GrowBig and the GoGeek. For those viral posts you want and for the best performance, choose the GrowBig plan. It comes with SuperCacher and you can add multiple sites and you don’t have to pay any extra. For only $5.95/month it’s a budget-friendly option when you’re bootstrapping your new blog. This is the plan I decided to have once I had my first viral post. And if you aren’t sure about starting a blog, you can always start with the StartUp plan. It’s $3.95/month and will get your blog up and started on the cheap. After you choose your plan, you’ll go to step two which is choosing your domain name. Plug in those names you figured out and see which ones are available. After this, you fill out your payment and purchase information. Be sure to pick at least the 12-month payment plan or longer to secure the 60% off discount. This means you pay for a full year (or more) up front (but it gives you the biggest savings and you don’t need to worry about another annoying monthly bill). Click on the box that you agree to the terms and you’re on your way to your brand new blog! Yay! 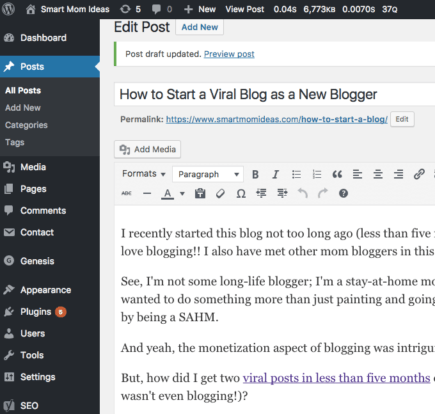 Now you need to install WordPress so you can start blogging. SiteGround makes it super duper easy because they will do it for you. Use their Live Chat and ask them to install WordPress. It’s as easy as that. You send them your login information and domain name and in about 15 minutes you’ll have your WordPress up and running. 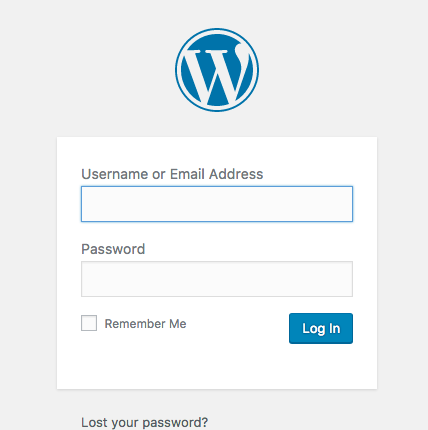 Once you login you’ll be taken to your WordPress dashboard and editor. This is where you can write your blog posts, install plugins, and add images. This is where all your content is. You can look at all of your posts, add a new one (this is the image I am showing you. On the right is this post I am writing) and add your categories. I suggest you set up your categories first so that you can create your menu later. Tags are certain words that talk about your post. You add the tags but I personally don’t use them and feel they aren’t used much nowadays. After you set your categories you can write your first post. Before we go into writing a viral post, let’s look at the WordPress editor. Click on this to open up your tools like you see in the image above. When you write your blog post, it’s best to break up your post with sub-headings (like I’ve done in this post). Use Heading 3 when you have a sub-topic under your Heading 2. I don’t go more than Heading 3. I just use the Bold function. This is just a general guide, your theme might be different, but be sure to use Heading tags to help out your SEO! You can use bolding and/or italics to emphasize certain words or phrases. You can use lists to break up your post or itemize tips. When you write more posts, you can start linking them to each other. This is interlinking and it’s good for SEO and to make readers stay on your blog longer (i.e. they click on your link and it takes them to another post of yours). This is where you can click to add a link to a word or phrase. This is where you house all of your images or if you have PDF guides or checklists for your email subscribers. When you are writing a blog post and want to add an image, you just click on add media at the top or you drag and drop the image where you want it. Pages are static. They are used for things like your About page or your Resources page. These pages don’t have categories and won’t show up on your blog. You can show your pages in your Menu or on your side bar. I like putting some of my page topics in my menu along with my categories. When you start getting comments this is where you’ll see them. This is where you can have a contact page for readers to contact you. You will need a Contact Form plugin to install and customize. Here is a really good post walking you through those steps. Here is where you can have some fun and find a nice free WordPress Theme. 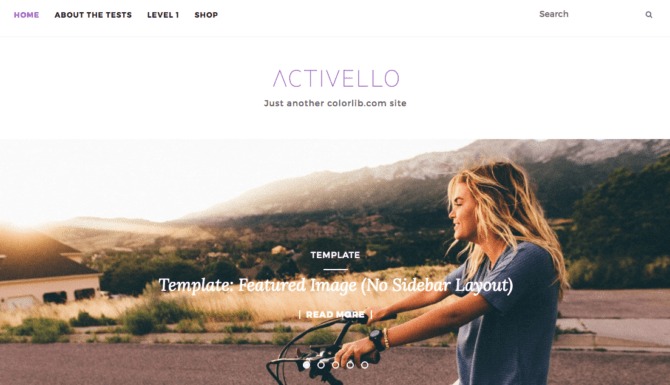 After you install your free WordPress theme, you can customize your blog. You can add a logo, add a favicon (that’s the small image next to your blog name in the browser bar) and other things. This is how you can build your sidebar or footer. You can add widgets like your categories or tag cloud. I just add the text widget to make my little About summary or my disclosure for affiliate marketing. This is where you can build your menu. If your blog has a header image you can add it here. If you know some codes you can use the editor. For more features, you can go into Settings to change or update information. Now comes the fun part – finding a theme and customizing it. My current theme is pretty basic and minimalist for now, but I’m always on the lookout for something fresh and new. So, let’s say you decided on the free Activello. I’ll give a general walkthrough of what I’d do to get things set up. All themes are slightly different, but once you get the hang of it, it’s no biggie! After you install and activate the Activello theme, go to Appearance > Customize. You can go to Site Identity to put your favicon and logo on your blog. 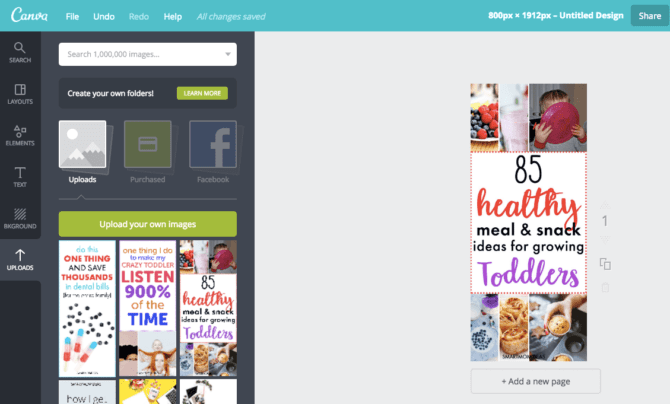 Canva is a great place to make your graphics and it’s free. Next, set your menu by going to Appearance > Menus. Make a name for your Menu (I chose Main) and create it. Then under Pages, click on Categories > View all and select your category topics and add them. Click on Save and go to the top of your dashboard to visit the site and see your menu. I like to have an About Me summary on my side bar so new readers know who the blogger is right away. Go to Appearance > Widgets. I wanted the picture to be rounded like you see on a lot of blogs these days. So, here’s how I did it. If you’re not comfortable with HTML and code, just skip over this part. Square is nice too and I was this close to having mine square. Go to Pages > Add New and write a paragraph or two about you and your blog. Add images if you want and if you have some posts, link to those too! Now, it’s time to write your viral post. What I’ve found from the admittedly short time I’ve been blogging in this niche is that popular viral posts that do well on Pinterest and Facebook are list types of posts and unusual how-to’s. Since it’s hard to come up with an unusual how-to on the spot, I’ll dive into using a list type of post. Go to BuzzSumo and Pinterest to find if your idea is popular. For example, we found out that farmhouse decor is extremely popular on Pinterest. With a viral list post, make the list long and niched down as much as possible. Viral types of posts are usually in-depth and valuable. This means you can’t just list all your 80 ideas with no explanation. Take the time to write a couple of sentences for each of your tips. And, include a lot of beautiful pictures – free stock photos like these, pins from other bloggers or your own photos. Writing a viral post takes (me) a LONG LONG LONG time. Like…a really long time. It’s a project for me, and one that I love doing. But I don’t whip these out in a few hours. On the bright side, I usually learn a bunch of new ideas and pick a few tips that I can use with the kiddos! To get more traction for your blog, create multiple Pin graphics and share them on your boards and on group boards. For me, there’s nothing funner than spending hours in Canva or Photoshop. I get to be all creative and all. For even more traction, promote your post on Twitter and on your Facebook page. Many mom bloggers are using a program called BoardBooster to get their Pinterest-fu on. I am not using any scheduling tools right as of today (**update** I’m now using Tailwind and loooving it**), so I’m manually sharing my posts on social media. I have a schedule to promote my high re-pin’s posts. It’s a hobby for me, I get to see what other bloggers are doing, and it sure beats cleaning the kitchen for the umpth time of the day. If you use BoardBooster or a similar program called Tailwind, you can schedule your big list posts more often. There you go! How to start a blog using SiteGround and WordPress and how to use WordPress to create your first viral post! This is such an amazing and interesting read. it is very helpful to me, as a newbie in this field. Thanks for the worthy stuff. It will definitely helps me. Glad you enjoyed how to get a viral blog post for sure! There are a lot of little steps to get you there! Has anyone out there tried 1Q? I earned my first $1.00 with them a few minutes ago. Hope there is plenty more where that came from. Great stuff! I had been wondering how to add an “about me” on my sidebar. I was using a plugin, but wasn’t too thrilled with it because it was really small. Thank you for showing me step-by-step how to add that! Thanks for coming over! Glad you figured out the About me thing! 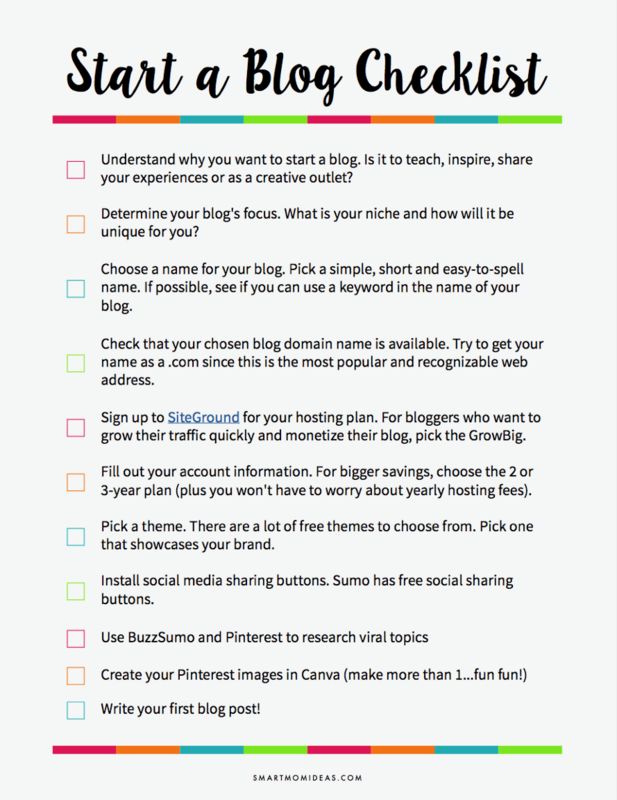 LOVE that you included stuff like “why are you starting your blog” to the list. So many of these type posts just jump straight into the technical. I wish I had thought about WHY I was starting my first blog (long gone) before I just jumped into it. I just started the “Blogging Resources” section of my website because I was getting so many questions about blogging, but haven’t attacked the entire “how to start a blog” post yet…because it’s going to be long. Jennie, I couldn’t agree with you more. This post was super helpful and I always enjoy reading all of her stuff! Thanks so much! Yes, the why is super important. You just don’t want to jump right in eh? Thanks for coming over. Wow! This is so helpful and has so much great information. I’ve been blogging for about a year and am struggling with traffic. I downloaded and printed your checklist. I can’t wait to look it over! That’s awesome. If you are struggling with growing your traffic, why not try this course called Ready Set Blog for Traffic from TwinsMommy.com! It’s budget-friendly! Great post. Though I have been blogging for years now, I have never worked on a mission. Mostly blogging was a creative outlet, I hadn’t even had niche figured until very recently. So hearing about creating a viral post gives me the motivation and boost required to take them as seriously. Thanks again. That’s great to know! Good luck! Awesome and thorough post! Our new site is under construction and I’m currently working on content. Our main biz is surf photography and a vacation rental in Costa Rica but I also enjoy DIY crafts, travel, Instant Pot cooking and trying out new hacks to make our home as organized as possible. Wishing you the best on your blogging journey!! Sounds good and your topics sound great! Very nice, well-explained post. I started my blogs less than a month ago and I’m learning so much. I hadn’t heard about BuzzSumo before, but will definitely check it out! Congrats on starting a blog! Having fun? Buzz Sumo is fun. It times out after 3 or 4 times but I like searching for niche topics and seeing what’s popular. Wow!!! I’m glad I found this! You have so many helpful tips and step-by-step guides. Wow! Thanks. I hope I helped you with starting a blog! Would love to see it if you have one soon! Thanks so much! Do you use affiliate marketing on social media (since you said you’re not really doing blogging)? Great Information on this post! I’m curious to know what you did to post to Pinterest that made them so popular! For my viral post, I pinned them to my boards and then repinned to group boards. I did around 30 pins a day so 10 in the morning, 10 in the afternoon and 10 in the evening. Then it got picked up by others and others were pinning it! It was nice! This is really a massive guide about starting a viral blog. You have shared some cool tips which need to test in my blog as well. Thank you for writing such a detailed article. Keep going…. You’re site is cute! Love the chubby wubby baby! Your ultimate guide to exercising while pregnant is a good post. I would work hard on getting a nice Pinterest graphic. Also break up your paragraphs a bit more to make it easier to read. I had a hard time reading each sentence and most people won’t read past the introduction if it’s hard. I would put more pictures of you exercising while pregnant too! THis will make it more personal. So much great information, having trouble absorbing it!! Thank you so much for your insight. I look forward to using so many of your great tips. <3 Thank you. Bookmark the post and you can come back to it! Great info! Thanks so much for sharing. I’m new to blogging and loving it, but am trying to soak in all the tips I can! That’s great. I am too! Thanks for sharing! I am saving this to re-read a few times as there is so much to take in! <3 Thank you so much. So glad this post was helpful! I just want every mama to start a blog! ha..
Super thorough and helpful! I’ll definitely have to check out BuzzSumo, sounds great for market research. I liked how you’ve included more tips above and beyond “just signing up for WordPress” because it’s in these details that things can get confusing. Yeah, I can spend all day showing people WordPress (I’ve spent hours learning it and actually enjoy using WordPress now!). Thanks so much. Wow, this was great – thank you!! As a new blogger I am still trying to navigate the process and find my footing with content and readership growth. This was so very helpful! I love the idea of placing a short bio on the sidebar of the site. That’s great and thanks so much. I never know if I write long long long posts if people will actually read through it so thank you so much! Yes! That’s so true. Pinterest helped me get to this point. I only recently started Facebook and Twitter. What a great tutorial! Will definitely be implementing some of your ideas! That’s great. So glad you found this guide helpful. This is such a helpful and comprehensive post! Thanks so much! I spent days on it. So happy my son enjoyed water play for five hours!! ha.. Thanks for a great post! I just launched my blog one week ago, http://www.vigoritout.com family, fun, and fitness. I suppose it’d be considered a lifestyle blog too. I’ve never heard of BuzzSumo and Pinterset and I think your tips are well written and actionable. I can’t wait to gain the traction you have! Thanks again! That’s awesome! Wow, you have a lot of content on your blog! Congrats! Glad you learned about BuzzSumo!